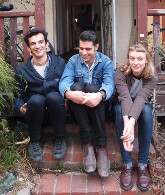 Today we have new music from the Australian band Chook Race and the spanking brand new tune from Tav Falco and his Panther Burns with Mike Watt on bass. We alco introduce Beware of Darkness from California, Apocalypse Blues Revue from Florida, Bob Hillman also from Cali and The Meredith Hunters from France. Safeties are in our Live in CLE block. Tav Falco’s Panther Burns – Where the Rio Dolorosa Flows.